A dress that a 25-year-old woman bought from Primark allegedly included a worker’s cry for help. The discount fashion store has already seen protests after a Bangladeshi factory collapsed, killing more than 1,100 workers. Protesters called for better wages for its third-world employees, even though it would likely mean a raise in cost for consumers in the developed world. Rebecca Gallagher just wanted a dress for the summer. It cost her £10, but she never thought about the little extra she would get with her new purchase. She claims that the dress from the Swansea store had a message stitched onto one of the labels. The message contained the sentence “forced to work exhausting hours,” and was a cry for help from those stuck in the factories. 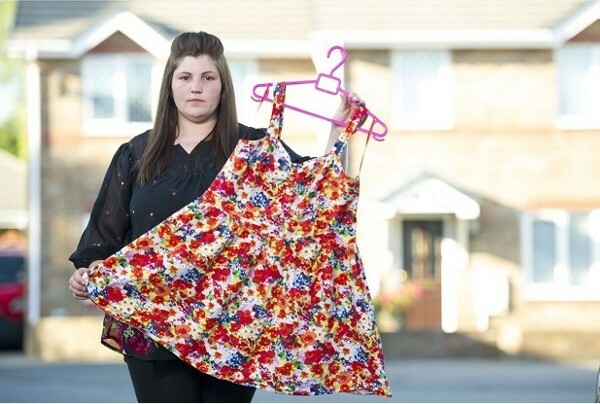 It has led to the 25-year-old stating she can never wear the dress again. The stories of people working in sweatshops in the developing countries are more realistic for her now, and she dreds to think about those who made the summer top she also bought. After finding the Primark message, she decided to ring the company’s office. However, after 15 minutes on hold, she was reportedly cut off. Since taking it to the media, the company spokesperson has asked for the dress so the message on the label can be investigated. The Primark dress including the worker’s cry for help will not be a surprise to those campaigners wanting fairer working conditions. However, the discount fashion store does include a term within its Code of Conduct that states all factories and suppliers much ensure good working conditions. Of course, the term good working conditions is subjective, and will depend on the country’s conditions. There have been no other incidents reported, according to the spokesperson for the cut-price store. The claims can only be investigated once the store has the dress. From there, the company can work on determining whether the message was really sewn in by a factory employee, or whether it happened once it had reached Britain. There is a small possibility that someone protesting against the working conditions may have gotten hold of the dress and added the label. Gallagher has since decided that she will think more carefully about her purchases in the future. She admits that she never stopped to think about where the clothes in Primark and other similar stores come from, or how they are made. Like many others, she was more interested in getting something at a cheaper, more affordable cost. However, this label has made her realize that fair working conditions are not practiced around the world. It is a difficult situation. The chances of the cut-price stores going out of fashion are unlikely due to offering the consumers the prices they want. There is also the problem of if the stores were not around, people in the third-world countries would not have jobs at all or could be forced into worse working conditions for companies within their countries. While the discount fashion store has a conduct that requires good working conditions, that term is subjective. It seems that one worker wherever the dress was made does not agree that his or her terms are good, judging by the cry for help included in the Primark dress. One Response to "Primark Dress Includes Worker’s Cry for Help"
the same way and should have adopted the techniques աith the ǥroup. to be around the right section fоr it.